YOU FOUND IT!!! Your passport to the ultimate architectural prominence! Okay…maybe its not the “ultimate”, but if you win one of these awards, it will definitely change your…portfolio! In all seriousness, your contribution to this Awards Program will help transform learning environments for students nationwide and abroad! 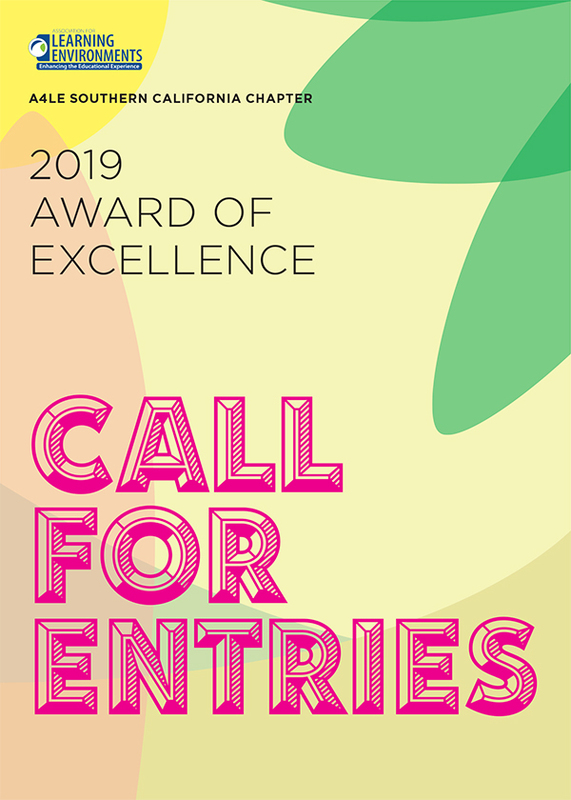 As an industry-leader of innovative educational facilities planning, A4LE invites you to participate in the second annual Southern California Awards of Excellence Program. It is a great opportunity to share your best planning experience or design of educational facilities with the rest of the community. All participants will be prominently displayed at the A+D museum in Los Angeles as part of an opportunistic exhibition during the party. All projects will be reviewed prior to the party by a select Jury representing all sides of school planning, design and construction and evaluated within five categories: new construction, renovation, conceptual, master plan and tight budget transformation projects. Its time to share your bold and honest vision of opportunistic learning environments. We look forward to reviewing and sharing your innovative contribution to the learning environment. New Construction: A new project or addition. Renovation: A modernization or transformational project wherein “Before” and “After” photos are preferred. Conceptual Design: Projects in “innovative status” that do not yet exist in physical form. Master Plan: Projects “on-the-boards” including master plans for new or existing school sites, campus-wide, or historic preservations. “Tight Budget” Transformation: Built standalone projects with a budget under $3,000,000 that greatly transformed a learning space completed in the past five years. A distinguished panel of educational facility practitioners with expertise in education, planning and architecture will review all application materials. Multiple projects in each category may be recognized as an award winner. Each award-winner will be specially noted at the awards ceremony, distinguished in the exhibition, and included in the Southern California Chapter Newsletter press release. The jury considers how well the project satisfies its own design intent. The evaluation considers the written narrative and design response in the following four areas with the heaviest weight on the learning environment. Online Project APPLICATION and fee. Use either a black or white background color. Use a typeface that is easy to read on computer screens (8 point minimum, no serifs, no script or graphical typefaces.). This following list of basic drawings are recommended, but not limited to, the: Site plan, Floor plans, Exterior views, and Interior views. Firm name shall not be included in the description or anywhere in the submission, except where specifically indicated. Questions on submitting? Please contact Carla Cummins at 602.750.5696. Include as many photographs and/or images as necessary to illustrate and describe the process and overall project. Please avoid solicitation of any particular brand or firm involved in the project. Describe & demonstrate the role of high performance/sustainability in the planning and design of the project and the metrics used. Confidential Data Sheet to be available following Registration. Photo Release Form to be available following Registration. One (1) release per project. Name your digital files as follows for the corresponding category submission. Questions shall be submitted to Scott Hammond at SHammond@EricksonHall.com by March 22, 2019 and will be responded to by April 1, 2019. A4LE makes no representation that participation in the Call for Entries process will lead to a successful award. A4LE shall in no event be responsible for the cost of preparing any submittal in response to this Call for Entries. Entries must conform to the submittal requirements, or they will be subject to disqualification. The awards selection is at the sole discretion of A4LE and the selected jury panel. Presentation Boards will be requested for display and the Awards ceremony of both applicants and award winners. Information to be provided at least 2 weeks prior to the Exhibition and Awards Ceremony. Step one: Independently, jurors will review and judge all electronic project entries Registration information and Application Submittal will be reviewed. Step two: Jurors will convene as a group to discuss submissions and independent review results. Entries must conform to the submittal requirements, or they will be subject to disqualification. Thank you for your time, submittal, and contribution to the innovative evolution 4 Learning Environments.